The traditional 16ft larch built River Tay 'coble' is an amazing tool in a professional boatman's hands as it allows the fly or lure to be presented over the salmon lies at the 'optimal' angle of approach which would be much more difficult or sometimes impossible to achieve from a riverbank position. The boat fishing approach with an experienced Tay boatman is a real craft whether anchored up, trolling or traditional River Tay 'harling' is being performed. There's nothing that betters a day out in the boat which a professional Tay boatman if a less physically demanding yet effective salmon fishing day is required. Even though the Tay is the biggest and deepest Scottish salmon river she has beautiful salmon fly fishing pools on most of her 38 salmon beats. In the higher water levels of Spring salmon can be caught on the fly by those confident enough to be out using this fantastic salmon fishing method. During the lower water level periods of the year the Tay transforms into the most beautifully sculpted salmon pool riffles and glides just the same as you'd see on a shallower Scottish rivers during perfect water conditions. For me this is the time for a serious fly fishing approach as there's always a real chance of a fresh fish on the Tay even when the river is running at her lowest. Most of us started our salmon fishing careers by launching a spinner across the river before any thoughts of a fly rod were ever considered. On odd occasions I still like to go out with a spinning rod and apply maximum 'intense' water coverage on the Tay which seldom doesn't produce at least one hooking opportunity. Spin fishing on the Tay is popular with many salmon anglers for various reasons and the main one is ease of water coverage compared to the higher skill levels required with a fly rod. Some may think that it diminishes the salmon catching experience but I've never found that to be true as there's still a big thrill involved when success is achieved with the spinning rod. Personally as a professional River Tay ghillie I used to think it was always best to separate all of the above salmon fishing approaches as best I could. 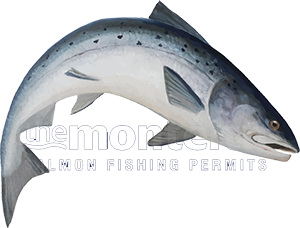 Whether it truly made a difference to a salmon if an angler was allowed to spin through a pool before a fly fisher fished I do not honestly know but it did always make a difference to the fly fishing guest's thoughts. Very few fly fishers are happy about their fly water being spun prior to them fishing it so simple fly/spinning pool segregation or a no spinning before lunchtime rule seems to keep everyone happy. Ultimately the salmon beat head ghillie makes that call and his operational decision should be respected and is always final. As a youngster taking every opportunity I could get for a cast on the Tay I was fortunate to be around many of the 'old school' River Tay ghillies who'd often be out working the boat with guests. I was always taught that the boat gets 'right of way' on a salmon pool and when the boat approaches a riverbank angler the angler was expected to wind in and recommence fishing some 60 yards upstream. Personally I think that's a bit rough on the bank anglers so utilising the boat on pools that were not as popular with bank fishers was always my first approach or at least letting the bank rods fish through the pools first before putting the boat through it. None of this should ever cause problems if common sense and a tactical explanation is given to all fishers at the start of the day. The professional ghillie ambassadors of the River Tay are indeed a rare and talented breed of men having the skill, knowledge & experience to be able to give 'astute' professional advice on all of these various salmon fishing tactical approaches compared to many other Scottish rivers which are mainly just riverbank fly fishing venues. The Tay ghillie is the real 'ninja warrior' of the Scottish salmon fishing world and if you're fortunate to be around one who's a few or more decades of riverbank experience under their belt then listen closely to any snippet of information they'll divulge as these are indeed true salmon fishing 'golden nuggets' of wisdom.